An independent Baptist church celebrating a pagan holiday by burning Bibles. What's wrong with this picture? Anyone wishing to really understand scripture should read all the translations and then go to the greek and read about the key words of a passage. The King James totally misses the enterchange between Jesus and Peter in John 21, Jesus uses Agape (Love of God that puts the other first) that is translated love in verses 15 and 16 when asking Peter if he loves Jesus. In response uses the word Phileo (brotherly love signifying that he was broken from his bragging ways) that is also translated love. In verse 17 Jesus asks a third time, do you love me, but this time he also uses Phileo and not Agape!!! This is the key to the verse that Jesus is no longer asking if Peter can love as God loves but only asking if he could love in brotherly love, this upset Peter because he had failed Jesus so badly already. When he says Jesus knows all things, he is saying that Jesus you know be better then I know myself! In verse 18 Jesus is saying you will keep your word this time Peter and you will not fail me because you will die for me! Now go read the text and without knowing that Agape and Phileo are the words for love it appears that Jesus is badgering Peter when he is not, he is testing Peter to see if Peter will humble himself and admit his limits only to have Jesus gives grace to the humble in this case telling him his future is to die for Jesus and thus keep his word, something he could not do as a proud man. So go read the King James version and tell me it is accurate in it's translation of this passage?!?!?! in response uses the word Phileo should be Peter in response. I agree totally with Walkinglove. How great is it that "Rev" Grizzard thinks so highly of the King James Bible. I wonder if anyone has told him that King James I was...mmm...light in his loafers? From Wikipedia, "Throughout his life James had love affairs with male courtiers, in particular Esmé Stewart, 6th Lord d'Aubigny (later 1st Duke of Lennox); Robert Carr, 1st Earl of Somerset; and George Villiers, 1st Duke of Buckingham. In his own time he was notorious for his male loves, and it was said of him that Elizabeth was King, now James is Queen (Rex fuit Elizabeth, nunc est regina Jacobus)." Hail the Queen! King James I mean. Aaaaah yes David Cloud. The Johnny Robertson of independent Baptists. It's general practice for me to avoid anything on this blog or elsewhere regarding "KJV-onlyism" because I am a Bible-believer and a King James only one, at that. I'm not looking for an argument on the issue because that's up to personal conviction, I think, and generally, sides are already taken and there's no changing minds. However, this compelled me to speak because, unfortunately, it always seems that the King James-toting Christian is always labeled as a loon and it's men like Grizzard that give that perception. It's an unfair representation of a group of honest Bible-believers who don't hate because of their convictions. I feel it should be noted that C.H. Spurgeon was said to bow to his Bible (a King James version) and while I don't do that, I don't fault him for believing it to be worthy of it. Psalm 138:2 says, "...thou hast magnified thy word above all thy name", and if one believes the Bible to not just contain the Word of God, but to BE the very Word of God, and Jesus Christ is "The Word" (John 1) and the King of kings isn't it all related? Like I said, I don't bow to mine, but by believing what it says and believing God is big enough to preserve it correctly, is how I show it the reverence it deserves. To tromp on the version because of a media-indulged screwball is in bad form and could be dangerous, especially if the attack is brought on ignorantly. The problem enters in when the "Believer" gets so consumed with Version vs. Perversion that they neglect the Great Commission which is going forth and teaching all nations. Arguments breed more hate than conversion. Oh. As for the above comment about King James being an alleged homosexual: regardless of whether or not he was gay has no bearing on the translation, the translators or the text and to bring that up is like the elementary-schoolyard "Your Mama"-game of manuscript evidence. Roxy says "Oh. As for the above comment about King James being an alleged homosexual: regardless of whether or not he was gay has no bearing on the translation, the translators or the text and to bring that up is like the elementary-schoolyard "Your Mama"-game of manuscript evidence." Perhaps it isn't anything of the sort. Perhaps it's an example of the simple fact that ALL are God's children, even the non-straight ones, and He uses them as He sees fit. I never said God couldn't use a gay person, but read the comment in the attitude in which it was given and responded in kind. It was spiteful and condescending and said nothing about God using anyone. It was an attack, not a call to re-evaluate my opinion of homosexuality or Romans 1:26-27. If Sir Anonymous' comment was meant to be read differently, perhaps I should let Eugene Peterson give it to me in simpler language as I honestly misunderstood. My apologies. And if all are God's children, then how do we reconcile John 8:44, "Ye are of your father the devil..."
Actually, I think "Anonymous" comment was more along the lines of commenting on how some who are often rabidly ant-gay and use the KJV as the basis for their beliefs, seem to deliberately ignore the historical evidence of King James sexual orientation, and at the same time, show that God is as likely to use his gay (and lesbian, bi and transgendered) children) as his straight ones. JessicaAsh: THANK YOU VERY MUCH! I am the one that posted about King James I being gay and how the Bible thumpers want to use that very book against all God's children -- with a book that was authorized by a gay man. Thank you for reading and understanding. As for you, Roxy, I love how you Christians pick and choose just whatever verse you prefer, and the best excuse of all used by Bible beaters is how only the New Testament applies...and forget the Old Testament. You know, my Bible is all one book, both Testaments are in one book. So while you're spouting off verses to use in Romans, the ones that fit your agenda, lets go back to the Old Testament and use some those too in your everyday life. How about; selling your daughter into slavery (hot like a video), not having anything to do with a woman on her period (nuff said), get a few slaves from neighboring nations (need a Mexican? ), eating shellfish being an abomination (so leave Libby Hill alone), and stop wearing garments from two threads (give up your charge account at Cato). C'mon Roxxy, when will you be putting your daughter up on the auction block? And the next time you're having a big ol' plate of shrimp at Libby Hill, remember Roxxy, you're comitting just a much of an abomination as King James I when he was on his knees...and not praying either. Or do abominations come in degrees? Buy one get one free? What a joke. 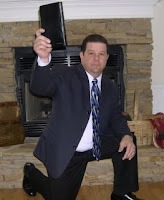 Having just read this blog on the burning of Bibles, it makes me sad. How is that people can get so lost in the legalities and translation of God's word that they completely miss the point of what is being said. The King James version was a translation of its time, but how can any one condemn a newer translation that is easier to read, follow and understand and therefore so much more accessible to people is beyond me. Wouldn't their time have been better spent praising God and teaching His love that is seen in every Bible no matter what the translation. Very distressing.